Thank you so much for your kind words regarding my announcement of my Floor and Decor partnership. I am so excited to see this project come together and promise to share everything along the way. Someone asked in the comments on my last post will we be doing the work ourselves. The answer is YES!! Every single bit of it. There will be in-depth video content posted on my YouTube channel as well, so make sure you are subscribed so that you don’t miss it. 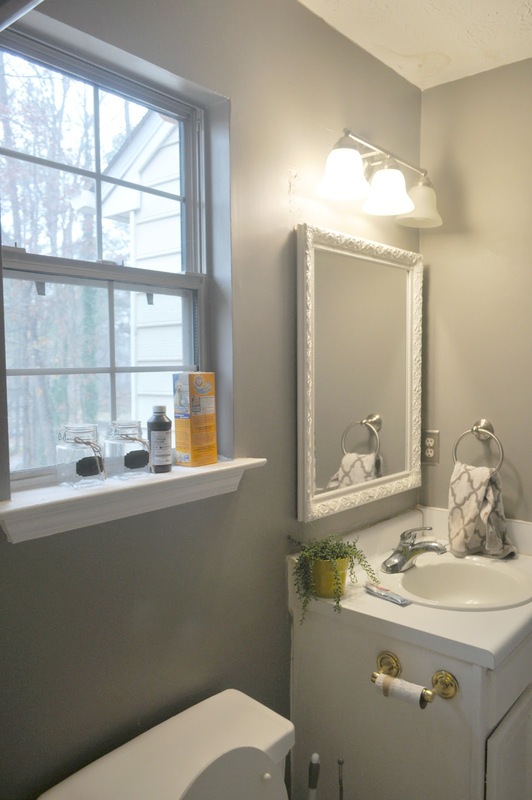 So let’s flash back to a few days ago when I showed you our current guest bathroom space and my tour of Floor and Decor, and the floors that we selected as the starting point for this makeover. 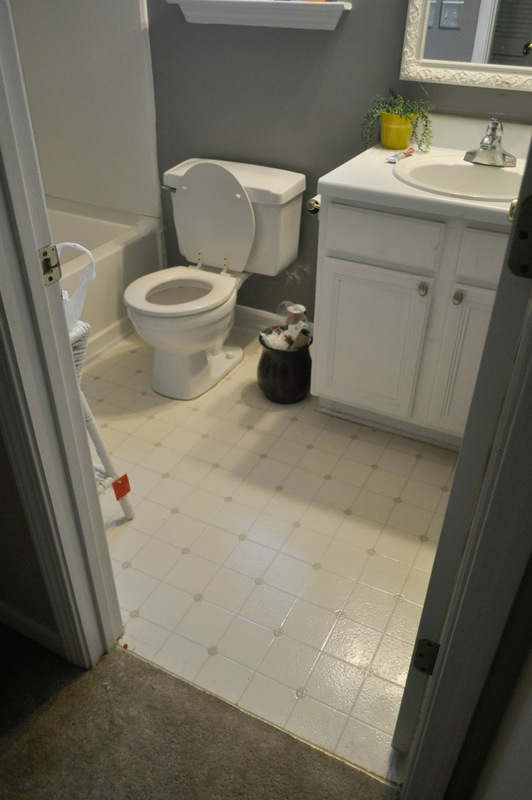 So you remember the before pics of the bathroom? The state of our current guest bathroom space is drab, sad, and blah, unlike the guest bedroom which everyone who visits seems to love! When I imagine this space, my goal is simple and classic. I want to avoid a lot of trendy pieces, and stick to something that both myself, along with my guests will enjoy for years to come. This is not a full gut and remodel, so the changes I will mostly be making are cosmetic. First, I will be removing the current mirror, and replacing it. Round is the route I would like to go but I am not quite sure just yet. Then I will add a fresh coat of paint. I’ve decided to go with the paint that I have in my living room...Benjamin Moore Sea Haze, color matched to Behr Paint. It’s a nice soft gray-green color. The vanity will also get a coat of paint. Currently it is white. I am going back and forth about rather it will go light or dark. I guess you will have to stay tuned to see! We will replace the shower curtain, opting for a rounded version. 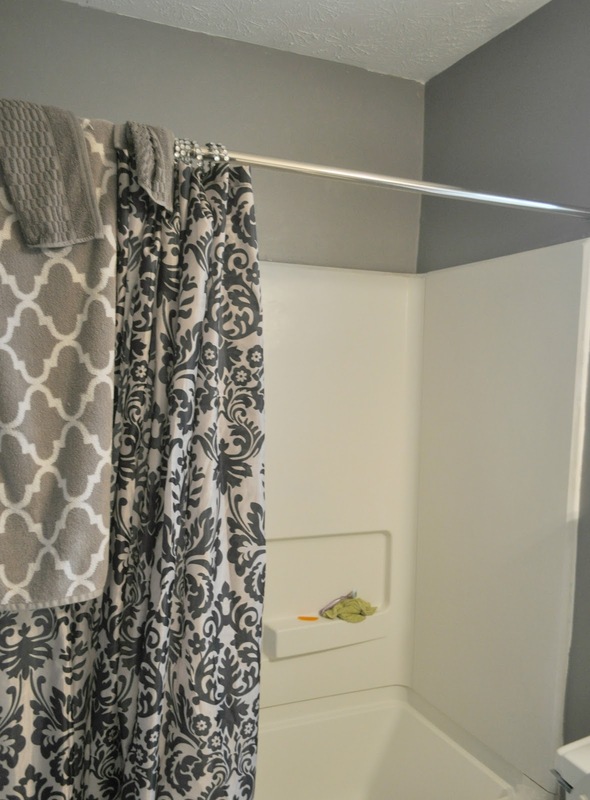 Curved shower curtains just provide more of a luxurious and spacious feel, especially in a smaller space. 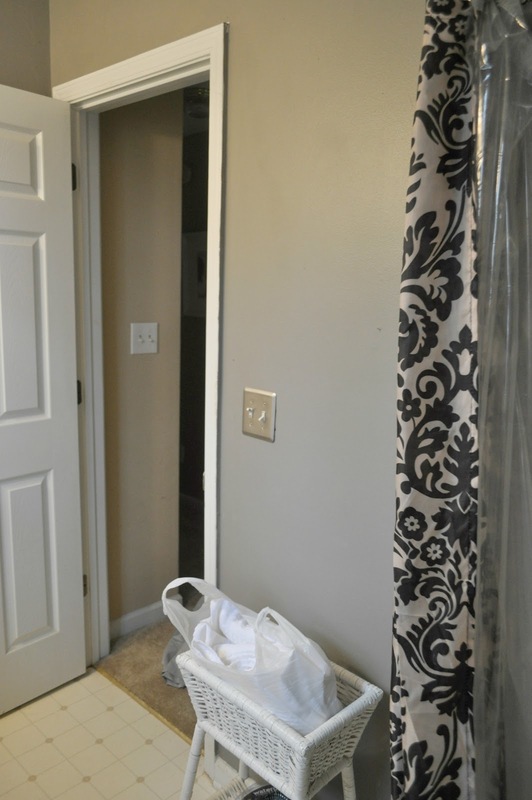 Piggybacking off the new curtain rod, the shower curtain will get a facelift as well. 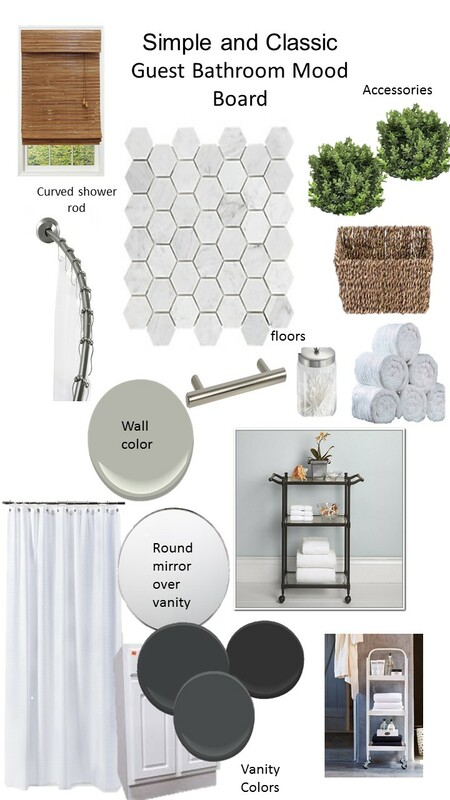 I’m opting for something more clean and fresh, with minimal pattern, as I want the floors to be the showstopper. Lastly, accessories!! This is my favorite part. I love styling and accessorizing rooms. It’s so fun to see everything come together just off of a few accessories. I am going for a mix of textures and contrast. So that’s pretty much it! What do you think? I am so excited for it all to come together. We’ve already gotten started with some of the “demo” work if you wanna call it that, and I am just too anxious. I hope your week is off to an amazing and productive start. I think it will be beautiful. I can not wait to see the floors. Love what you have planned Erin, and your adorable new profile picture! Thanks Lauren! It was time for an update! Erin this is going to be so fab! looks like you're heading towards a gorgeous and fresh space! Thank you Carli! It feels like its taking forever! Erin I can't wait to see the flooring tutorial! And my vote is for dark cabinet! thanks Alaya!The dark cabinet ha by vote as well! Anxious to see the reveal! In love with the flooring too. Can't wait to see the process and the reveal! Can't wait to see. Love the floor tile!! I love all your selections! I can't wait to see the entire reveal !! 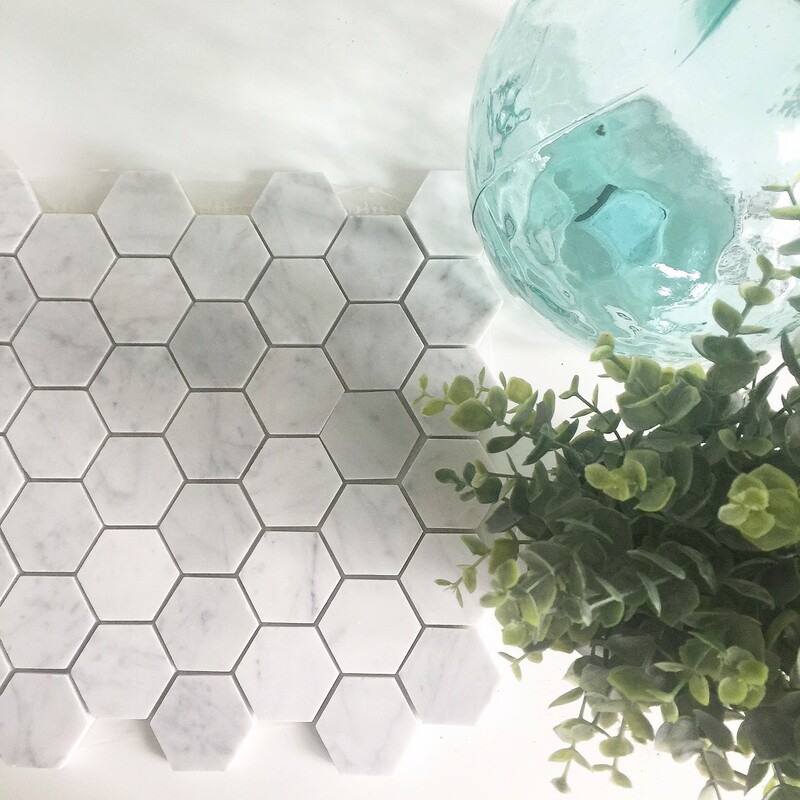 Love your tile selection and I'm anxious to see the reveal! Thanks Darnetha. I can't wait to share. This is going to turn out Awesome! Can't wait to see the finished results!! !